Sometimes it’s the smallest detail that grabs the attention. It was just a minute or so into this gig in the darkened, mercifully cool on a baking Sunday, Parabola Theatre. Yazz Ahmed gave a little Kenny Wheeler-ish riffle on flugel as an entry into a fluting, arcing theme; the heart skipped a beat and I was hooked. Still Here, the opening piece was like an entire suite compressed into a few minutes. A tango-ish pulse, driven by Karen Street’s accordion, gave way to an exuberant dancing melody, the ten-piece band providing a rich palette to buffet and cushion the spiralling lines. Tori Freestone on tenor played out over the returning tango, great sweeping phrases across the instrument’s range, with a little dying fall at the end to catch the listener’s breath. Street’s composition was a great opener and set the scene. 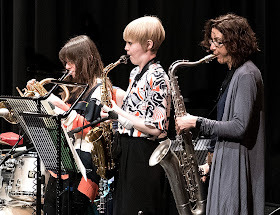 The band’s repertoire comes from the pens of its members and as diverse in interests and histories as they are, there was a coherence to the sound even though time allowed for just five pieces in this festival gig. Spontaneous Symmetry, a Freestone composition, was next, evolving patterns bouncing around the band before a series of dialogues provided the spontaneity. Ahmed spooled our more soaring lines with Brigitte Beraha responding, her wordless vocals blending exquisitely with the flugel’s sound. Freestone jousted with Street over deliciously responsive interplay from Charlie Pyne on bass and Katie Patterson on drums. Beraha’s Donna’s Secret was next, and then a commission from Nikki Iles, the only piece not by a band member. Issie Barratt announced this one and if she’d told us it was a lost piece from Kenny Wheeler’s Sweet Time Suite it would have made perfect sense. Negomi was freighted with the bitter-sweet, joyful melancholy and harmonic richness of the Wheeler oeuvre and the band played their heart out. Freestone stole the show again with a hooting, swooping emotional solo. Barratt’s own Kulning closed out the set. As they struck up, a quick double check of the stage was needed to make sure a full orchestra hadn’t crept on such was the electrifying texture the arranging conjured from the band. They built to a moment of uproar and closed with a whisper. A lovely end to a compelling and emotional set of top drawer contemporary jazz. Barratt put this project together, inviting people she particularly wanted to work with and it looks like she’s continued her track record of serial ‘shaker and mover’. There’s a recording and album promised for later in the year. It’ll be one for the wish lists. 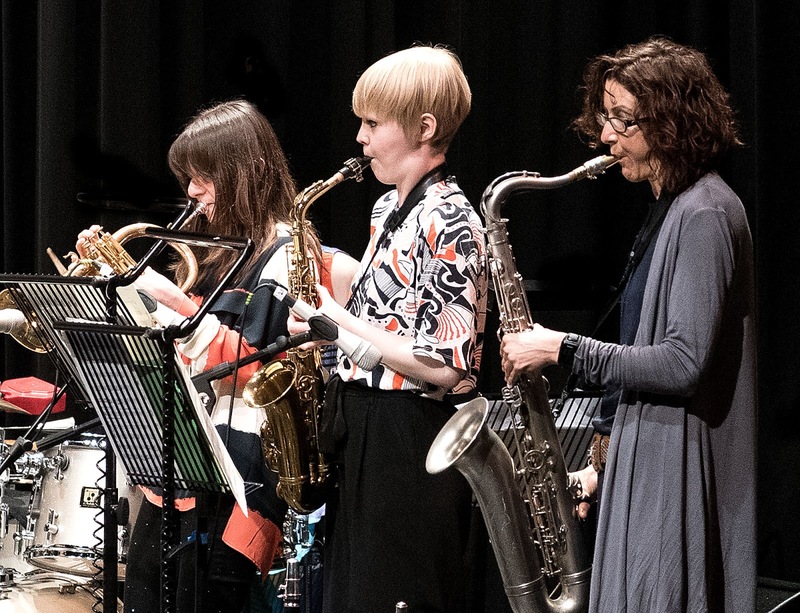 Full Line-up: Brigitte Beraha voice; Yazz Ahmed trumpet and electronics; Helena Kay clarinet and alto saxophone; Tori Freestone flute, soprano & tenor saxophones, violin; Issie Barratt baritone saxophone; Emma Bassett trombone; Shirley Smart cello; Karen Street accordion; Charlie Pyne bass; Katie Patterson percussion.